And they come in adult sizes too. Sadly, I didn’t have my camera when I passed a woman who was at least in her 60s sporting a one-piece snowsuit when it wasn’t even cold out. Granted, that’s a bit unusual, but it seems anyone in the 12 and under crowd needs to be in a snowsuit from about September to April. I think it’s a bit excessive, but I’m rolling with it. This has been what I see of my daughter every time we’ve been outside for the past few months. A hot pink blob with a black heiney and purple shoes. The hot pink becomes a bit less ‘hot’ as she keeps kneeling in the dirt, but then I wash it and she glows in the dark again. Amazingly, that little hat didn’t even come with the suit. And neither did this one. Wot chu lookin at, gurl? Since my Money Monday post ended before Maggie actually got the chance to try out the Jump Jump, I thought it would be fitting for today’s Wardrobe Wednesday to be a sort of follow-up. Does Maggie wear the Jump Jump well? Yes, yes she does. Apparently the Jump Jump phase of life coincides with the hand-chewing phase of life for both of my girls. (Compare to Dagmar in the Monday post.) They also both entered the Jump Jump phase before people who make Jump Jumps expected them to. None of these jumping devices seem to think children of this height are going to use them, because they’re always up way too high. But trust me, by the time I don’t need to put an upside-down plastic bin under her feet, she’s not going to give a flying frog fart about the Jump Jump, because she’ll be crawling and/or furniture cruising on her own. At least if she’s ANYTHING like her big sis. We’ll see though. She’s less active than Dagmar was, for sure, but she still seems interested in mobility. In addition to the Jump Jump and upside-down bin, Miss Magdalena is sporting a one-piece sleeper from some department store in the UK. In the UK, much like in the US, people understand that snaps going down BOTH legs are a good thing. Denmark hasn’t caught on to this. Don’t ask me why. As much money as they charge for baby clothes here, they should put themselves on the baby for me, but instead, they can’t even bother to put snaps on one of the legs. I guess we Anglophones are just spoiled. I used to keep my food in cupboards above my countertop. I’m short. Add these two things together and you get someone who can’t see or find all her food without getting a step stool. And really, who gets a step stool every time they cook or bake? Well, obviously not me. I kept buying stuff that I already had. Over and over. And Over. I had five bags of flour, four bags of granulated sugar, and four boxes of powdered sugar. I had to throw out one bag of flour that had expired, and I was able to do some condensing, pouring half empty bags into one bag and so on. But I still have a bunch of extra. A couple of lucky friends are getting free baking supplies from yours truly. That sure is a lot of comparing. With Dagmar, I wondered what it was like to have a baby that actually fit into baby clothes. I don’t anymore. Check out Dagmar’s little chicken legs! Maggie does not have chicken legs. She fills out the whole onesie and Dagmar never did because she outgrew it lengthwise before she had the chance. Hard to believe Dagmar ate ALL DAY LONG and still had those chicken legs, isn’t it?! Maggie must have the best latch ever because she hardly ever seems to eat, but is clearly quite healthy. Sorry for the poor-quality iPhone pic in Maggie’s case. It’s almost hard to tell that’s the same onesie and same playmat. 😛 D’oh! I know I’m just full of excuses lately, but we’re rearranging furniture in our flat, and part of that means that the printer isn’t hooked up to the computer at the moment. The printer is where the Memory Stick reader is, which is how I import photos from my camera to my computer, so I haven’t imported in a few days. This means no super recent photos, but it also means I was inspired to find an old photo to use for Wardrobe Wednesday. So here I am. I think I’m 20, give or take, in this picture. I look bored and I have a zit on my cheek. I’m visiting my parents, so it’s likely during a Christmas break, but it might be the summer after my first year at college. I don’t really remember, and my parents live in Florida so it’s not like the fact that I’m in a knee-length skirt means it can’t be December. Also, I never go outside in Florida, so the fact that I’m the same color as the couch doesn’t mean it can’t be July. I no longer have any of the articles of clothing pictured here. The shirt I’m wearing over the tank top was probably already too small at the time, and the tank top and skirt definitely would not have survived the mid-20s “wait, what happened to my metabolism?” thing. I do still have that pillow I’m hugging, though. I don’t hug it around the house anymore, but I still have it. I could never get rid of Pillwy. There’s no real point to this post, I know, but that’s the best you’re going to get out of me today, unless you want to hear me rant about third-trimester mood swings. And even if you think you do, you don’t. Have a happy Wednesday! ETA: Feet Off the Table has taken over Wardrobe Wednesday officially! Now I need to remember to do my linky linky duties. Update: My wonderful husband, with all his native Danish knowledge and m4d g00gl3 sk1llz, found my screwdriver for megacheap online. It should arrive tomorrow. Fingers crossed that my hard drive is ok and I can recover all my stuff. The woman who started Wardrobe Wednesday is no longer doing it. I don’t really want to host anything formal, especially in this time of computer transition and pregnancy and whatnot, but I like doing WW, so here we go. I have a few hats. I hang them on pegs on the wall in our foyer. Dagmar doesn’t always have access to the foyer, thanks to our baby gate, but when she gets the chance, one thing she likes to do is try on my hats. I think the “no two articles of clothing are even remotely the same color” look really works on her. What do you think? Yes, I’m still alive. In fact, I’ve had a draft of a blog post for an embarrassingly long time, and even more embarrassing, this is not it. It’s not that I haven’t had things to say, it’s just… life getting in the way. So for my first post in a long while, I present a double feature, if you will. I’m combining the Money Monday I totally intended to post this week (also not the aforementioned draft) with some Wardrobe Wednesday fun. First, here’s my bump as of today. I’m 33 weeks pregnant. Yeah, I’m bigger this time, but not like OMG circus-freak big. So, we can stop with the comments about how huge I am, k? It’s getting old. I know with 100% certainty that I’m not having twins, that the baby is not unhealthily large, and that everything is going fine. It’s just normal, bigger-the-second-time-around-edness. Thanks. That said, it does certainly FEEL pretty darn big. Perhaps I’m just not as in shape this time, or maybe it’s weak muscles from having a cesarean before, or just from having had a baby in there once before, or what, but yeah. It hurts having a bump. As some of you may know, despite never wearing a support belt when I was pregnant with Dagmar, I’ve been using one for a long, long time this pregnancy. I dedicate this post to my wonderful support belt. I love you, oh support belt! You were worth every øre! Not that it makes all the pain go away, but it helps a lot. If any pregnant women out there are reading this and have ever entertained the idea of getting one, just go do it. For real. Best ever. Before the belt, it felt like my belly wasn’t even a part of me. It was just extra weight attached to me and pulling me down. I hated it. 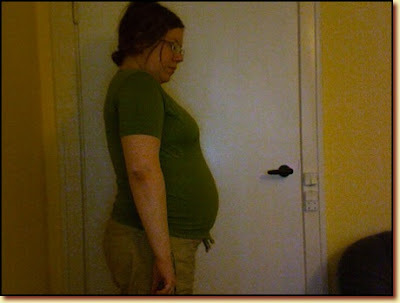 Now I only kinda dislike my bump, and it feels like it really is part of my body. An annoying part of my body, but hey, this is a big step up. I can’t believe I have nearly two months left to go, and that kinda makes me want to cry sometimes, but we’re getting there. Every day, we’re getting closer. I’m trying my darndest to think it’s cute when Maggie kicks me in the ribs. Thomas is probably getting tired of me calling him over to come feel the kicks, but if I concentrate on how fun it must be for other people, it keeps me from thinking about how uncomfortable it is for me. I don’t remember Dagmar’s kicks being this annoying. At least I have a support belt. Hopefully I’ll get around to posting again on Friday, but if not, I’m probably still alive. Just with a cold, a dead laptop, and a toddler coughing up a lung. No biggie. Wardrobe? Who needs a wardrobe?